“The Famous Storytelling Housewife of Mansfield: Laura Ingalls Wilder” written by Bill Izard for Porter Briggs, the Voice of the South was published on PorterBriggs.com just in time for the 2014 Wilder Days celebrations in the town proper of Mansfield, Missouri and at The Laura Ingalls Wilder Historical Homes and Museum on September 19-20, 2014. Events include the annual Laura’s Memories pageant presentations on Friday evening and Saturday at the Mansfield City Park, Little Laura Look-alike and Little Farmer Boy Look-alike costume contests, a bed rodeo/race and huge parade at the Town Square in Mansfield. There will be a Fiddle-off contest and a guest appearance by Lucy Lee Flippin, the actress who played the part of Eliza Jane Wilder on the TV program “Little House on the Prairie” at Rocky Ridge Farm. You can see a more complex schedule of events at the Mansfield Chamber of Commerce website. Mr. Izard wrote an excellent comprehensive article about life at Rocky Ridge Farm with bits about the Wilder Family. Both Laura and daughter Rose were journalists in their own genre and were very good at it. As a timeless writer, Laura’s stories have appeal to people in nations all over the planet. Because it all began at Rocky Ridge Farm, the community is committed to the preservation and restoration of the farm to represent a view of the life and times of the Wilder Family. You are invited to join that commitment with your gifts — think if it, if all of us who love Laura put in $5, how the gifts would grow for the project to preserve this ‘moment in history’ of America and this statement for a wholesome family lifestyle for all people. 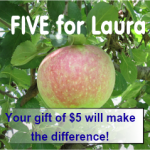 Join the FIVE for Laura movement today. You can make an online donation at this link — You can even use PayPal. If you prefer to mail a check or money order, the snail mail address is right there on the right hand upper part of the page for your convenience. Thank you again, Bill Izard for your insights and for PorterBriggs.com for publishing the article.